Last year it was the heat, this year it was the route. The Etape du Tour is never easy. 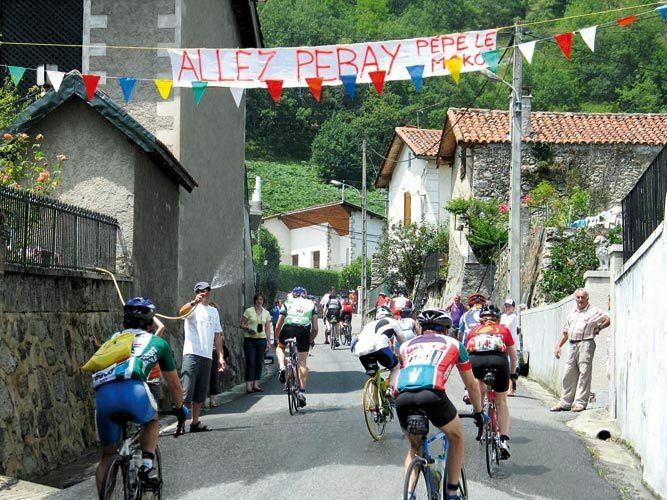 In 2007 it was the turn of the Pyrenees to host a Tour de France stage for all-comers, and what a stage it was. Five mountains — two second category, two first category and one ‘hors’ category, the class of mountain that the Tour de France says is beyond classification. The stage was 196 kilometres long, or 122.5 miles if you prefer. It ran between Foix and Loudenvielle-Le Louron and the climbs were the Col de Port, Col de Portet d’Aspet, Col de Mente, the Port de Balès and the Col de Peyresourde. A challenging mix of old and new Tour de France classic ascents. It was hot but not too hot. The constant sunshine was a bit of a blessing because the climate in the Pyrenees can be unpredictable, with rain in one valley and hot sunshine in another. Wind was the biggest problem. It blew hard in the valleys and was against the riders on some of the climbs, especially the Port de Balès, a place that will be forever etched on the memory of many 2007 Etapistes. Fastest times were set by Frenchman Nicholas Fritsch and woman Karine Saysset, who also won last year. Until recently Fritsch was a pro with FdJ and Saunier Duval, but couldn’t get a contract this season. He now races with French elite club AVC Aix en Provence — the same one as young British rider, Kieran Page. Fritsch is a good climber, who fellow pros reckon never really mastered the art of coming down mountains. Not that it showed in the Etape. Fristch won by nearly 10 minutes from Philippe Argens, with the next few riders bunched quite closely behind him. It was a display of the strength that can be gained from a few years’ riding in the pro peloton, even though Fritsch’s time was well shy of the Tour stage winner’s on the same course. There are numerous reasons why Alexandre Vinokourov went faster, not all of them savoury, although an important one is that the Etape strings out much quicker than a Tour stage, so it’s more of an individual effort, and the Etapistes had a raw deal with the wind compared to the Tour riders one week later. But the Etape du Tour isn’t really about winners, it’s about taking part, taking on the course, challenging yourself and the 1,001 things a normal cyclist has to balance against his or her passion. Yes, you could dope for the Etape and maybe some do, but wouldn’t it be pointless when everyone is a winner? The Etape, and events like it, are a breath of fresh air for cycling at the moment. They are about the joy and satisfaction to be gained from riding your bike as hard as you can over a very tough course. They are pure cycling, real cycling, the cycling that most people signed up for when they were first bitten by the bug. The Etape is for real cyclists, cyclists like Michael Briars, a 32-year-old IT consultant from London. He wanted a gold medal from the 2006 Etape, but his dream melted under the blazing sun on the Col d’Izoard. To make amends he trained with even more conviction for the 2007 event. “I started training in January this year with a friend, Adrian Lee, which was tough because the weather was awful. I’d kept in trim by running the New York marathon, but then I was relieved of my nice new training bike by some knife-wielding thieves and had to ride an old jalopy I picked up on eBay. “We started doing 70-mile rides on Saturday from where we live in north London to St Albans or Knebworth, and occasionally a 40-miler on Sunday if the hangover or weather allowed. “At first, time didn’t allow for midweek rides, but in March we stepped it up, kicking off with a five-day jaunt to Girona. It was just what we needed. We bumped into a few pros and had good weather, except for one day with a full-on electric storm and hailstones the size of golf balls. I stayed in a cafe whimpering like a dog under the hand dryer, leaving Adrian to complete another three hours in the mountains. He’s a Geordie. Briars and Lee were ready, but they knew that the target of seven hours 21 minutes for gold would be tough. Still, they were on good form and their choice of gear ratios showed their confidence. “We became a bit like minor celebrities because we didn’t have compact chainsets on. We were both riding 53-39, and Lee had 12-25 whereas I’d gone for a more sedate 12-27,” says Briars. “We started well, but I thought someone must have got it wrong when they said the first hill was the easiest, as neither of us felt that our legs were particularly fresh. Despite that we both managed to get in a good group, quite near the front,” says Briars. Then bad luck struck the pair and they got separated on the Portet d’Aspet due to Lee’s rear wheel collapsing. The heat began to get to Briars on the Col de Mente and he punctured on the descent, which cost five to 10 minutes in addition to the five or so he’d spent waiting for Lee. “I reached the 100km mark in three hours, well ahead of schedule, but looking down at my computer at the 50 to go sign on the lower slopes of the Port de Balès, I saw that I only had another two hours to play with. Where had all the time gone? “I worked out that I had to climb the last 12 kilometres of the Balès in 40 minutes, and it was at that point that the road kicked up and stayed there. The heat really started to beat down, the tarmac was sticking to my tyres. It suddenly became awful, even the locals handing up water started to get on my nerves. He accepts that he faded as the ride progressed and that the mountains sapped the strength from his legs. He thinks there are ways to combat that, but doesn’t see one of them as using lower gears. “I reckon that if you have a compact chainset you end up going slower over the course of the day. When you are knackered you’ll always reach for your lowest gear, without necessarily upping the cadence. Also you need bigger gears on the flat sections and downhills. The Etape is one of cycling’s great levellers. People come from all sorts of backgrounds. Novices like Martin Lear of Bristol, who only started cycling at Christmas but who finished in an impressive eight hours 28, determined young fitness enthusiasts like Briars and Lee, and experienced racing campaigners can all sign up and have a go. And everyone gets different things out of it. Miles Sharpe bravely completed the Etape dressed as a gladiator, raising money for cancer research. Every year since 2005 Miles has competed in a sporting event dressed as the mythical Tootus Maximus. This year his objective was to do two stages of the Tour, the British Cyclosportive and the Etape, “to complete the first GladiaTOUR de France,” he says on his website www.londongladiator.com. Yes, we know it’s a terrible pun, but he’s raised a lot of money so can be forgiven for it. The mix you get in the Etape is a big attraction. Among the top ex-pros taking part were a former Tour de France King of the Mountains, Steven Rooks, and a former world champion, Abraham Olano, who escorted his wife Karmele to a time of eight hours 29 minutes. Olano also currently leads the ex-pro marathon running league with a time of two hours 39 minutes set in the 2006 San Sebastian race. I asked him if, as a former swimmer he fancied following Laurent Jalabert, currently third in the ex-pro marathon stakes, in having a crack at the IronMan triathlon. “You never know,” he said. Another ex-pro Etape finisher, who judging from his comments when he crossed the finish line will not be copying the energetic pursuits of Olano and Jalabert, is Greg LeMond (see separate story). His presence, however, was a great boost to other riders, an endorsement of the event and of enormous practical value to at least one competitor. Dave Clinton is a former rower on his fifth Etape. “I did my first in 1998, then I had a go at the marathon, but I enjoy cycling more. I’ve done a Gran Fondo in Italy and I’ve done the Tour of Wessex twice. I joined a cycling club recently and they have got me riding the Surrey handicaps, which has taught me a lot, but one of the biggest lessons I’ve learned was today when I tried to follow Greg LeMond down the Peyresourde. I learned more about descending doing that than I have in all the time I’ve been cycling,” said Clinton after crossing the line in 8 hours 41, just a few seconds behind the first US winner of the Tour. Of course the day was bursting with stories of people exceeding their expectations, learning things about cycling and about themselves, and a few falling short of their goals. But results and striving to be better are only part of the Etape story. The rest is about the impressions and memories you come away with after riding the Etape. Neil Bradbury, an orthopaedic surgeon from Bath, says he will never forget “cycling through dusty villages, places with hardly anyone living in them, and there were people standing by the road cheering everyone through and handing up drinks. In another place there were kids lined along the street high-fiving any rider who went through. Then on the top of the Peyresourde there was a huge flag with the cross of St George on it. The Etape is a really emotional experience, a day of a thousand impressions,” he says. Cycling must be the new golf for orthopaedic surgeons — several took part in the Etape and one, Andrew Kelly, was well up among the top 10 British finishers. “I started doing Etapes four years ago and each one has been better, harder and more exciting than the one before. My sporting background in my distant youth was rowing, but I’ve always had a bike. I enjoy weekend rides with Somerset RC Tri, although I regard myself as a failed triathlete because I swim like a stone,” he says. The kind of support participants receive from the locals is another of the joys of taking part. Another thing that surprised Jones was the number of punctures that people suffered along the way, and the finish area was full of tales of tyre woes. Some thought that recent resurfacing work was responsible, but more experienced heads like Greg LeMond reckoned that some riders had inflated their tyres with too much pressure, which can cause problems when rims heat up on the descents after excessive braking. 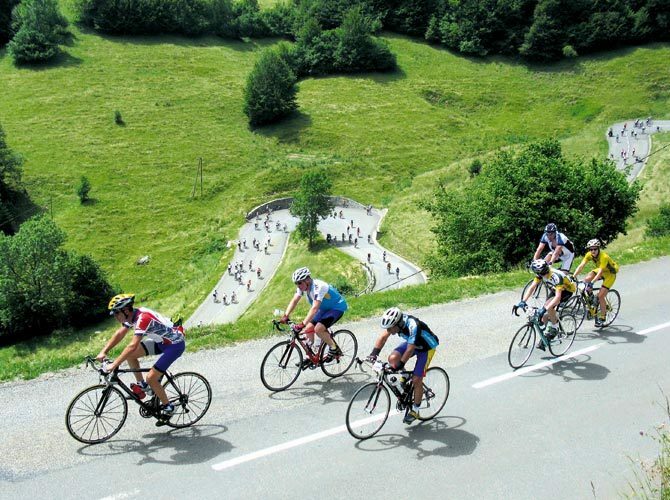 The Etape is a big day in the year for many cycling holiday companies. You can tell who works for them, they’re the ones stood on the finish lines holding a placard, festooned in cycling tops, wearing a worried look on their faces and alternately peering at their watches then squinting into the distance. They do this while answering 101 questions from their guests and seeing to it that anyone who keels over gets prompt medical help. It can be a hard job. On top of everything else they have to keep the early finishers happy while ensuring that the later ones don’t feel neglected. Mostly though, they do it with good humour and get very involved in how their charges do. Julie Wright owns Pyrenees Multisport with her husband Ian. 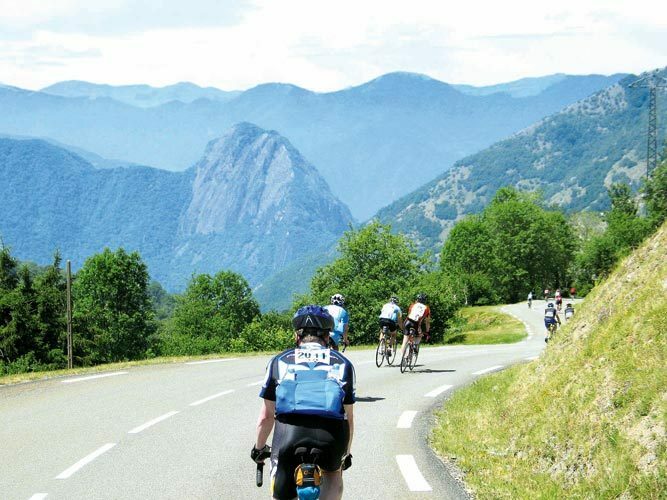 They are based in Lascan in the Pyrenees and had a group of clients riding the Etape. They also ran several Etape training camps before it. “The problem we had this year was that the summer was late, so the riders who came on the camps didn’t get a taste of how hot it would be today. One lot from Yorkshire even got stuck in the snow,” she told me. Julie was the team driver for the day, even though as a multi-Ironman finisher herself she probably wanted to have a go. Instead she put all her energy into cheering every one of her customers home, and with a voice that ensured every one of them heard her too. The Etape came in for some criticism last year, especially by some French magazines. The organisation was caught out by the heat, and water at the food stations was quickly used up. Also, Alpe d’Huez was a terrible experience. The weather in France was angry on that July day in 2006, and the Alpe became a furnace as the day went on. Many parched and exhausted riders suffered on what seemed like an interminable climb. 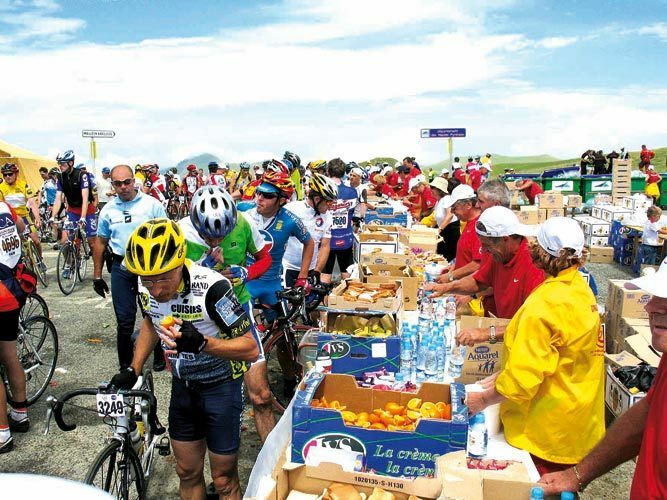 The organisation, which is part of ASO, the body that runs the Tour de France, put a lot of effort into the Etape, and it is one of the best events of its kind in the world. Numbers were slightly down this year though, and it was rumoured that entry on the line was possible even the day before. Does that mean that the Etape is becoming less popular? No, not really, it’s just that there are a lot more cyclo-sportive events in the world today and the market is more spread out. The Etape is still something that a lot of people will want to ride for a good few years yet. It’s a classic sporting challenge and most finishers agree that it is harder than anything else they have done. It’s also a pleasure to report. Witnessing the wholehearted efforts the participants make is one of the highlights of the year for me. THE best times put up by British riders were seven hours 24 minutes by Marc Bearman for 72nd place, and seven hours 28 minutes by Richard Todd for 89th. In third place, and first Brit over 40, was Paul Holdsworth, an experienced racer from a west London cycling club with a glorious long distance tradition, the Hounslow and District Wheelers. Paul is a veteran of several British Best All-Rounder campaigns and his preparation for the Etape comes from the week-in week-out training he does for time trialling. “I work shifts, so I can end up getting 250 to 300 miles in most weeks. My riding gives me the distance but there is nothing you can do to simulate the climbs and the heat. Two weeks after the Etape, Holdsworth finished fourth in the 2007 National 12-hour Championship, riding a distance of 278 miles.